This appendix describes the design and construction of lock picking tools. Picks come in several shapes and sizes. 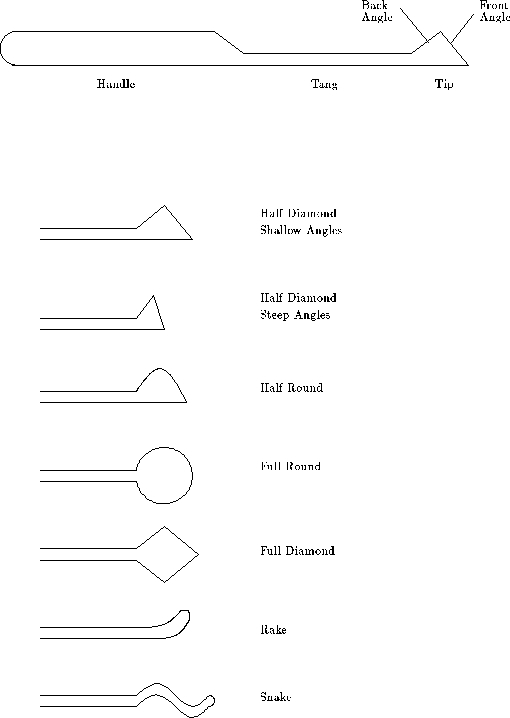 figure A.1 shows the most common shapes. The handle and tang of a pick are the same for all picks. The handle must be comfortable and the tang must be thin enough to avoid bumping pins unnecessarily. If the tang is too thin, then it will act like a spring and you will loose the feel of the tip interacting with the pins. The shape of the tip determines how easily the pick passes over the pins and what kind of feedback you get from each pin. The design of a tip is a compromise between ease of insertion, ease of withdrawal and feel of the interaction. The half diamond tip with shallow angles is easy to insert and remove, so you can apply pressure when the pick is moving in either direction. It can quickly pick a lock that has little variation in the lengths of the key pins. If the lock requires a key that has a deep cut between two shallow cuts, the pick may not be able to push the middle pin down far enough. The half diamond pick with steep angles could deal with such a lock, and in general steep angles give you better feedback about the pins. Unfortunately, the steep angles make it harder to move the pick in the lock. A tip that has a shallow front angle and a steep back angle works well for Yale locks. The half round tip works well in disk tumbler locks. See section 9.13. The full diamond and full round tips are useful for locks that have pins at the top and bottom of the keyway. The rake tip is designed for picking pins one by one. It can also be used to rake over the pins, but the pressure can only be applied as the pick is withdrawn. The rake tip allows you to carefully feel each pin and apply varying amounts of pressure. Some rake tips are flat or dented on the top to makes it easier to align the pick on the pin. The primary benefit of picking pins one at a time is that you avoid scratching the pins. Scrubbing scratches the tips of the pins and the keyway, and it spreads metal dust throughout the lock. If you want to avoid leaving traces, you must avoid scrubbing. The snake tip can be used for scrubbing or picking. When scrubbing, the multiple bumps generate more action than a regular pick. The snake tip is particularly good at opening five pin household locks. When a snake tip is used for picking, it can set two or three pins at once. Basically, the snake pick acts like a segment of a key which can be adjusted by lifting and lowering the tip, by tilting it back and forth, and by using either to top or bottom of the tip. You should use moderate to heavy torque with a snake pick to allow several pins to bind at the same time. This style of picking is faster than using a rake and it leaves as little evidence. The spring steel bristles used on street cleaners make excellen tools for lock picking. The bristles have the right thickness and width, and they are easy to grind into the desired shape. The resulting tools are springy and strong. Section A.3 describes how to make tools that are less springy. The first step in making tools is to sand off any rust on the bristles. Course grit sand paper works fine as does a steel wool cleaning pad (not copper wool). If the edges or tip of the bristle are worn down, use a file to make them square. A torque wrench has a head and a handle as shown in figure A.2. The head is usually 1/2 to 3/4 of an inch long and the handle varies from 2 to 4 inches long. 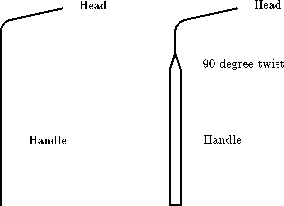 The head and the handle are separated by a bend that is about 80 degrees. The head must be long enough to reach over any protrusions (such as a grip-proof collar) and firmly engage the plug. A long handle allows delicate control over the torque, but if it is too long, it will bump against the doorframe. The handle, head and bend angle can be made quite small if you want to make tools that are easy to conceal (e.g., in a pen, flashlight, or belt buckle). Some torque wrenches have a 90 degree twist in the handle. The twist makes it easy to control the torque by controlling how far the handle has been deflected from its rest position. The handle acts as a spring which sets the torque. The disadvantage of this method of setting the torque is that you get less feedback about the rotation of the plug. To pick difficult locks you will need to learn how to apply a steady torque via a stiff handled torque wrench. The width of the head of a torque wrench determines how well it will fit the keyway. Locks with narrow keyways (e.g., desk locks) need torque wrenches with narrow heads. Before bending the bristle, file the head to the desired width. A general purpose wrench can be made by narrowing the tip (about 1/4 inch) of the head. The tip fits small keyways while the rest of the head is wide enough to grab a normal keyway. The hard part of making a torque wrench is bending the bristle without cracking it. To make the 90 degree handle twist, clamp the head of the bristle (about one inch) in a vise and use pliers to grasp the bristle about 3/8 of an inch above the vise. You can use another pair of pliers instead of a vise. Apply a 45 degree twist. Try to keep the axis of the twist lined up with the axis of the bristle. Now move the pliers back another 3/8 inch and apply the remaining 45 45 degrees. You will need to twist the bristle more than 90 degrees in order to set a permanent 90 degree twist. To make the 80 degree head bend, lift the bristle out of the vise by about 1/4 inch (so 3/4 inch is still in the vise). Place the shank of a screw driver against the bristle and bend the spring steel around it about 90 degrees. This should set a permanent 80 degree bend in the metal. Try to keep the axis of the bend perpendicular to the handle. The screwdriver shank ensures that the radius of curvature will not be too small. Any rounded object will work (e.g., drill bit, needle nose pliers, or a pen cap). If you have trouble with this method, try grasping the bristle with two pliers separated by about 1/2 inch and bend. This method produces a gentle curve that won't break the bristle. A grinding wheel will greatly speed the job of making a pick. It takes a bit of practice to learn how make smooth cuts with a grinding wheel, but it takes less time to practice and make two or three picks than it does to hand file a single pick. The first step is to cut the front angle of the pick. Use the front of the wheel to do this. Hold the bristle at 45 degrees to the wheel and move the bristle side to side as you grind away the metal. Grind slowly to avoid overheating the metal, which makes it brittle. If the metal changes color (to dark blue), you have overheated it, and you should grind away the colored portion. Next, cut the back angle of the tip using the corner of the wheel. Usually one corner is sharper than the other, and you should use that one. Hold the pick at the desired angle and slowly push it into the corner of the wheel. The side of the stone should cut the back angle. Be sure that the tip of the pick is supported. If the grinding wheel stage is not close enough to the wheel to support the tip, use needle nose pliers to hold the tip. The cut should pass though about 2/3 of the width of the bristle. If the tip came out well, continue. Otherwise break it off and try again. You can break the bristle by clamping it into a vise and bending it sharply. The corner of the wheel is also used to grind the tang of the pick. Put a scratch mark to indicate how far back the tang should go. The tang should be long enough to allow the tip to pass over the back pin of a seven pin lock. Cut the tang by making several smooth passes over the corner. Each pass starts at the tip and moves to the scratch mark. Try to remove less than a 1/16th of an inch of metal with each pass. I use two fingers to hold the bristle on the stage at the proper angle while my other hand pushes the handle of the pick to move the tang along the corner. Use whatever technique works best for you. Use a hand file to finish the pick. It should feel smooth if you run a finger nail over it. Any roughness will add noise to the feedback you want to get from the lock. The outer sheath of phone cable can be used as a handle for the pick. Remove three or four of the wires from a length of cable and push it over the pick. If the sheath won't stay in place, you can put some epoxy on the handle before pushing the sheath over it. An alternative to making tools out of street cleaner bristles is to make them out of nails and bicycle spokes. These materials are easily accessible and when they are heat treated, they will be stronger than tools made from bristles. A strong torque wrench can be constructed from an 8-penny nail (about .1 inch diameter). First heat up the point with a propane torch until it glows red, slowly remove it from the flame, and let it air cool; this softens it. The burner of a gas stove can be used instead of a torch. Grind it down into the shape of a skinny screwdriver blade and bend it to about 80 degrees. The bend should be less than a right angle because some lock faces are recessed behind a plate (called an escutcheon) and you want the head of the wrench to be able to reach about half an inch into the plug. Temper (harden) the torque wrench by heating to bright orange and dunking it into ice water. You will wind up with a virtually indestructible bent screwdriver that will last for years under brutal use. Bicycle spokes make excellent picks. Bend one to the shape you want and file the sides of the business end flat such that it's strong in the vertical and flexy in the horizontal direction. Try a righ t-angle hunk about an inch long for a handle. For smaller picks, which you need for those really tiny keyways, find any large-diameter spring and unbend it. If you're careful you don't have to play any metallurgical games. For perfectly serviceable key blanks that you can't otherwise find at the store, use the metal strap they wrap around bricks for shipping. It's wonderfully handy stuff for just about anything you want to manufacture. To get around side wards in the keyway, you can bend the strap lengthwise by clamping it in a vice and tapping on the protruding part to bend the piece to the required angle. Brick strap is very hard. It can ruin a grinding wheel or key cutting machine. A hand file is the recommended tool for milling brick strap.